We were at PAX West this weekend, but there has been a lot of content around the web from our time at Gen Con 2016! Many new releases were covered, and we teased some upcoming games and accessories coming out later this year and into 2017. If you didn't have time to track it all down, here are some highlights. Rhea and I had a chance to sit down with Brittanie Boe of GameWire to talk about Bill & Ted's Excellent Boardgame. Note some cool secret stuff in the background! 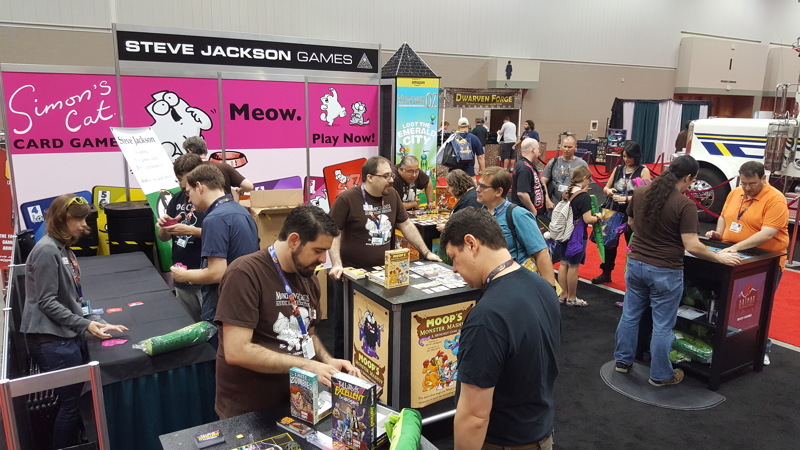 John Booth of GeekDad wrote an awesome piece on his interview with CEO Phil Reed, Line Editor Andrew Hackard, and artist John Kovalic, talking about the 15th anniversary of Munchkin. And of course there were lots of blogs, like Tribality, Techaeris, Bad Coyote Funky, Crossfire Co-op, and more, covering all sorts of games – including the upcoming Car Wars 6th Edition. Last but not least, the Purple Pawn got a sneak peek at some art for next year's Munchkin Collectible Card Game! Whew, that's a lot of stuff. And more is on the way! Follow us on social media where we share content like this as soon as it's posted. Thanks to everyone who took the time to talk to us!